Thousands Of Inmates Serve Time Fighting The West's Forest Fires When there's a wildfire in California, odds are there are low-level offenders battling it. Inmates trained by pros and making $2 an hour have become a crucial element of the state's wildfire response. Emir Dunn, an inmate firefighter stationed at the Chamberlain Creek Conservation fire camp in California, at work on a fire. About 4,000 inmate firefighters battle blazes across the state. As wildfire season rages in California, firefighting help is coming from an unexpected place: prison. Thousands of low-level offenders have become a crucial component of how the state battles wildfires. If there's a wildfire here, there are inmates battling it. 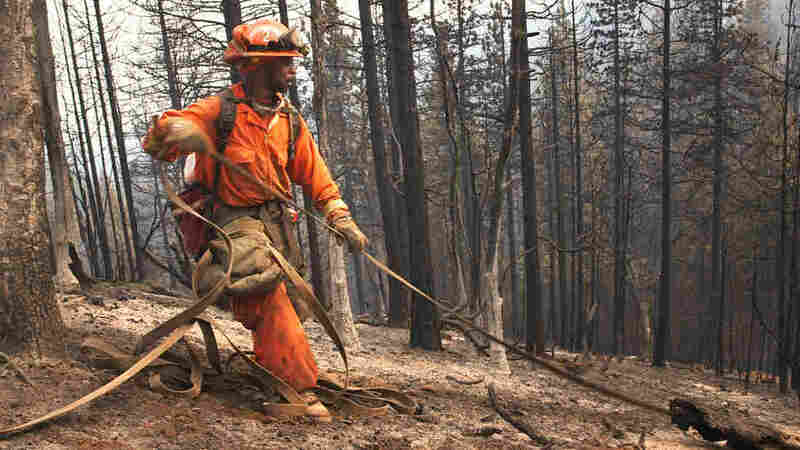 Emir Dunn is one of the inmates working a wildfire in the mountainous area of northern California near Oregon. The fire has already scorched nearly 13,000 acres and the temperatures here are unrelenting. "First day we was out here, it was like, 111 or 115 [degrees] — and that's not including the fire," Dunn says. His orange fire suit swamps his slender body, but don't be fooled: Just like the 900 or so inmate firefighters out here, he lugs more than 100 pounds of gear with him — an ax, food, water, fuel for a chainsaw. Dunn and his crew are on mop up duty, looking for embers that could reignite. He's zipping a flattened hose through his gloved hands, scraping it along the dirt and burnt brush. Other states like Wyoming and Nevada have similar inmate programs, but the California Department of Corrections program, with about 4,000 inmates, is the largest. Corrections officials say the program saves the state more than $100 million a year. These offenders have been convicted of things like drug crimes, minor battery or robbery. They're trained by a professional and often work in crews of 16 — always with a professional firefighter in charge, like Capt. Josh Kitchens. Kitchens, who runs Dunn's crew, looks straight out of central casting: tall, with a chiseled jaw and the stare of someone who doesn't play around. "These guys are some workhorses. When it's time to do a lot of grunt labor, that's what we're good at. Get a lot of stuff done with 16 bodies," Kitchens says. Corrections guards dropped off the inmates miles away; the team then hiked in. So basically, Kitchens is alone with inmates who have axes and chainsaws — in the middle of the forest that happens to be on fire, often working 24-hour shifts. But he's not worried. "It's just like working with any other group of guys," he says. "You kind of get to know their personalities and what they're capable of, and you put them in positions most suited for them." The inmates earn $2 an hour fighting fires, and get two days off of their sentences for every day they are out here. When they're not battling the flames, they build flood barriers or clean up parks. In those cases, they get a one-day reduction for a day of work. The inmates will spend nearly all of their sentences in a fire camp, where they stay in barracks-style sleeping quarters. When on a fire, they'll move to a base camp, where on-site warehouses and large white tents house the prisoners. There are many guards here, but you won't see guns, truncheons or barbed wire. Inmate firefighter Cory Sills says that creates a completely different vibe from prison. "There's an assembly where we have a formation in the mornings," he says. "And it was like, my second or third day, and the lieutenant comes out and he's giving a speech about his day and he goes, 'Look, we'll treat you like men first, firefighters second and prisoners if we have to.' "
But it's not just the atmosphere that the inmates say helps them thrive. For inmate firefighter Michael Dignan, the program's taught him about himself. "You learn that there is stuff you can put yourself through that you never thought you'd been able to do," Dignan says. "You think you're done. You're just not. Or when you see that last hill you have to climb and you tell yourself you can't make it, you end up at the top of it." Dignan will need that perseverance. He's scheduled to be released soon. He says he'll go back home to Ohio then, and back to tree trimming — what he did before being locked up. A few others on the crew say they might try firefighting when they're released — but most say, "No way." In the audio version of this story, as well as in a previous Web version, we incorrectly say that inmates are paid $2 a day to fight the fires. In fact, they are paid $2 an hour.